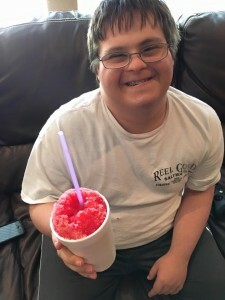 The new owner of a Texas snow cone business is showing the world what people with Down syndrome can accomplish. 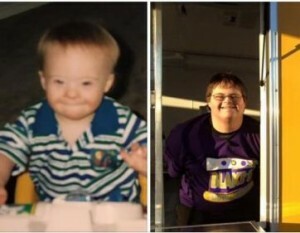 20 year-old Blake Pyron is not only the youngest person in his city to become a business owner, he is also the first business owner in his hometown of Sanger, and possibly all of Texas, who has Down syndrome. Pyron was born to Mary Ann and Billy Pyron in 1996. His mother told Live Action News that she was asked by her doctor to have an amniocentesis, but she refused. The couple had vowed to accept any child the Lord gave them. Mrs. Pyron said that she had never heard about Down syndrome before her son’s birth. Medical personnel gave a gloomy prognosis for her son and offered no hope for his future. Her biggest fear was that her son was going to die. 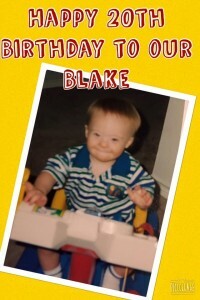 “Whenever Blake was born, I did not know what Down syndrome was. I was just 25 years old and his father was 26. When the doctor came in and said she thought he had it, I said, she is crazy, he is so perfect. They just didn’t give us a lot of hope,” she explained. As Live Action News has previously reported, women who are told their preborn child has Down syndrome are often pressured into an abortion, something disability advocates call a horrible and violent form of discrimination. A 2012 academic review of published literature on abortion after a prenatal diagnosis of Down syndrome in the United States found that more than half of preborn children with Down syndrome are aborted. Nine hospital-based studies included in the review showed the rate of abortion to be as high as 85% when a preborn child is diagnosed with Down syndrome. The prognosis the Pyron family received was bleak, but Mrs. Pyron and her husband refused to accept that outlook. “In the hospital they were like, ‘Well, he might be able to walk, he might be able to talk.’ They didn’t give us much hope for Blake’s plans. But we had faith,” she told the local ABC news outlet. 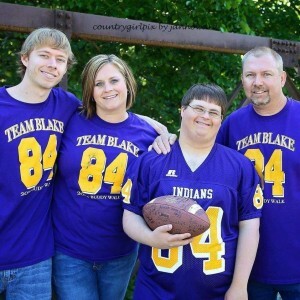 “We always knew in our heart that this wasn’t the truth – that God has a plan for Blake,” she added. And she was right. Her son far superseded the doctor’s predictions, and went on to become a football captain, the prom king, citizen of the year for Sanger, and Dallas Fort Worth Super Star. And he has appeared in a country music video. Mrs. Pyron explained that when Blake was born the family did not have blogs, Facebook or websites to go to and reach out to others with the same struggles. She said only one family she met had a child with Down syndrome. 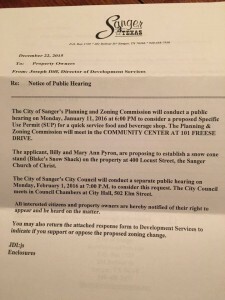 When we finally got the paper from the city we realized that it was 20 years ago at that exact same time that the hospital was telling us he had Downs. 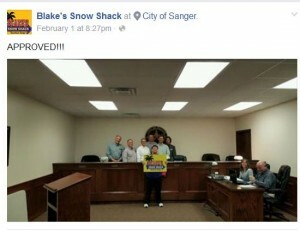 And here he is becoming the first Downs business owner in Sanger and the youngest business owner. 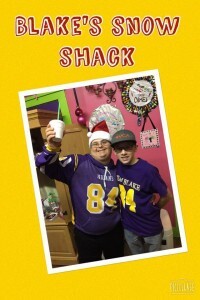 Possibly the only one person with Downs in Texas to own a business. Pyron, who is the president of his company, told Live Action News and that he is very excited about the business and he loves all the interviews. He has always wanted to be a business owner and said he looks up to his friend and neighbor Tanner Maple who will help him as his first employee. Pyron admits that he really loves snow cones, noting that his favorite flavor is blue coconut. 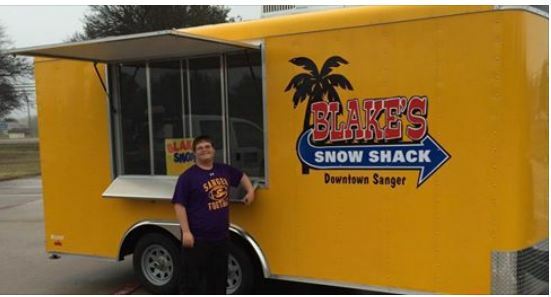 Blake’s Snow Shack will open in April. After hearing Pyron’s story, a Dallas Ad agency has committed to helping him with his grand opening which will take place May 7, 2016. 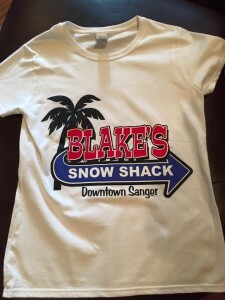 In advance of the opening, supporters can place orders for a Blake’s Snow Shack T-shirt on his Facebook page here. For Mrs. Pyron it has never been about a snow cone business. For her it is about the babies, and how Blake’s story will help mothers of these children understand how full their lives are.